Castle Rock State Park is so popular among South Bay hikers that it’s tempting to think it must have some flaw overlooked by the masses. Camping: Backpacking only at Trail Camp (2.4 miles from main parking lot), $10 per night. No reservations; campfires allowed during winter and spring. Call (408) 867-2952 for the latest camping information. Waterman Gap backpackers camp, on the Skyline to the Sea Trail, must be reserved — call Big Basin Redwoods State Park at (831) 338-8860. Driving directions: Take Highway 9 from Saratoga to Saratoga Gap intersection with Highway 35. Go south for 2.5 miles to the main parking lot. I keep expecting this flaw to emerge when I visit (see what an optimist I am? ), but it never does. Well, if you go there on a weekend during the school year, you might be overrun by a hundred Boy Scouts earning their camping merit badges, but the amusement of seeing grown men in scouting uniforms is ample compensation. 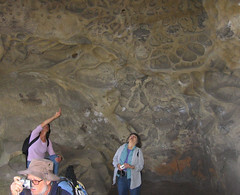 Castle Rock’s rocks are the main attraction: sandstone formations riddled like petrified Swiss cheese with large and small holes created by water slowly seeping into the stone and eroding pockets over the course of thousands of years. Some of the holes are so big you can climb inside for a closer look. Others are small enough to provide handholds for climbers. All reward close scrutiny. My favorite things at Castle Rock are the tangled stands of madrone trees bending toward the sun. With all that peeling bark, they’re the nudists of the arboreal world, and you can touch one without getting slapped. Standard precautions: A short section of the rocky Saratoga Gap Trail has a steep drop-off with a steel cable for a handhold; it’s a bit scary. The woods are dotted with poison oak. If the kiosk at the main parking lot is staffed, buy a map; it costs $2 (available by mail by writing to Castle Rock State Park, 15000 Skyline Blvd., Los Gatos, Calif. 95033). Easy: Go less than a half-mile to Castle Rock, the park’s signature sight, and explore its countless nooks and crannies. Step carefully, especially if the rock is wet. Moderate: Take the Saratoga Gap Trail to the Trail Camp — it tracks a rocky, exposed ridge for about 2.6 miles; it has tricky footing but amazing views. Return 2.4 miles along the shady Ridge Trail, which climbs through lovely madrone groves. Pause at Goat Rock, and watch the climbers practice. Hard: Stuff your gear into a big pack, and spend the night at Trail Camp — a great place to learn the basics of backpacking. It’s first-come, first-served, and apt to be crowded with Scouts some weekends during the school year. But otherwise the camp is lightly used and offers many scenic, shady spots.